This article explains what each field is and does under the Modules tab in system setup. SMS Account Details is where configuration information is placed when you have an SMS service with us or one of our supported 3rd-party providers. Credit Card Account Details is where configuration information is placed when you have a Credit Card Autopay service with one of our supported 3rd-party merchant / providers. Service provider drop-down can only be edited by Storman Support. Direct Debit Account Details is where configuration information is placed when you have a Bank Direct Debit Autopay service with one of our supported 3rd-party merchant / providers. In the Online Payments System (aka StorPay) section, you can specify whether you allow users who are paying online to make part-payments. If you enable this option, users must can only pay the full amount when paying online using the Online Payments System. The Online Reservations System section provides configuration options if you have purchased this module from us. 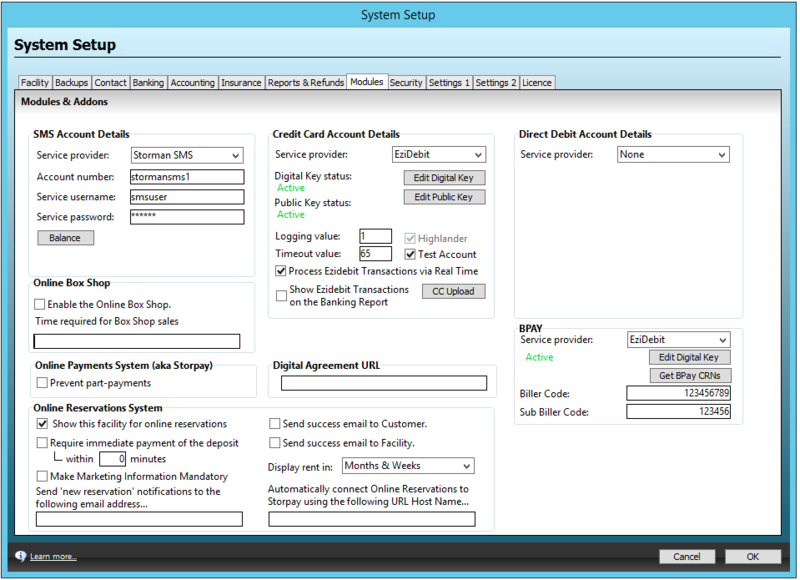 Settings include whether to show the current company within the Online Reservations System, whether the Deposit needs to be paid immediately (and, if so, within how many minutes of the Reservation being made), the email address where notifications of new reservations are sent, how to display rental amounts, whether marketing data is mandatory to the user completing a reservation online and the StorPay (online payments) URL to use if you use our Online Payments System & require immediate payment of the Deposit. BPAY These fields are for the Bpay credentials of your site. These fields can only be edited by Storman Support.